Some timber decks involve large square or rectangular areas spanning a single level. 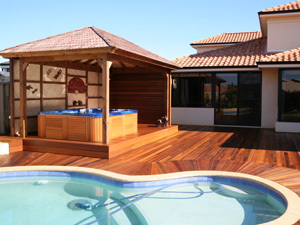 Other timber deckings involve multiple levels, difficult onstacles and intricate patterns or curves. 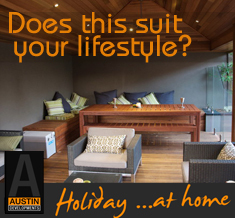 Whatever the challenge in your timber decking project, the team from Austin Developments are among Perth’s most experienced specialised timber decking design and construction professionals. The curved pool on this particular job posed several problems , not only was it curved but the tightness of the curve over a short distance was extremely difficult for the installers / carpenters. Each timber decking board had to be cut on 3 sides making it an extremely time consuming and tedious job taking twice as long to finish compare to normal. The attention to detail on the curve decking not only is a feature itself but creates a soft transition between the pool and the large entertaining sun deck. Other obstacles this job posed like any pool decking is the pool plumbing around the perimeter , this means the trades all have to take extra care when digging and installing concrete footings to support the deck. Sometimes initiative on the tradesmans behalf is more important than the actual designer , as most hurdles and problems are all spontaneous last minute issues that the tradesman have to combat to fore fill a design that ultimately will impact the projects final result.